A pre-existing Agile adopter, DentaQuest recently started working with NeoLoad after experiencing some significant testing time delays and reporting inconsistencies with their previous performance testing solution. The NeoLoad decision was not an easy one. DentaQuest had wrestled with maintaining loyalty for the incumbent vs. head-to-head comparison of industry front-runners LoadRunner and NeoLoad. DentaQuest is the second largest dental benefits administrator in the United States and the largest in the Medicaid space. 24 million members across the United States are taking advantage of their innovative solution offerings. The company is steadfast in its commitment to delivering better outcomes at lower costs. Rallying around an improved oral health for all charter, DentaQuest continually seeks to raise oral health awareness with an ardent promotion of oral solution effectiveness. Applications under DentaQuest IT management represent three business units. Tests are conducted in concert with the cadence of each release, last up to four hours, and simulate up to more than half of today’s 800 total peak users. Each test’s design requires a sign-off by Performance Testing team, who will compare results with the most recent run. Similar performance is considered testing success; inconsistency sends them back to the drawing board. Before NeoLoad, performance testing was time-consuming and produced inconsistent results. As part of its evaluation to keep the current tool vs. fresh start with an industry-leader, DentaQuest cites NeoLoad’s budget friendliness and ability to cover their full business stack with ease as key determinants. Working under a weekly release schedule, DentaQuest seamlessly aligned NeoLoad with its existing use of Dynatrace for APM (another critical solution requirement for DentaQuest). 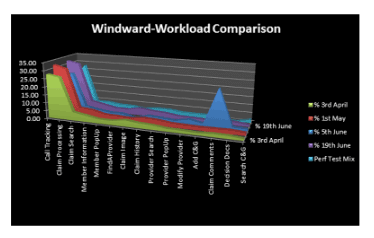 Performance and load testing focused on the vital claims processing/customer service call-handling application. As the DentaQuest team considers the next chapter in their performance testing practices with NeoLoad as a key contributor, they feel confident that the increased productivity, testing speed and quality will allow a more proactive role in SLA creation and attainment. Having the comfort in knowing that Neotys training and support is always a phone call away will go a long way in helping them realize the desired “shift further left” state.